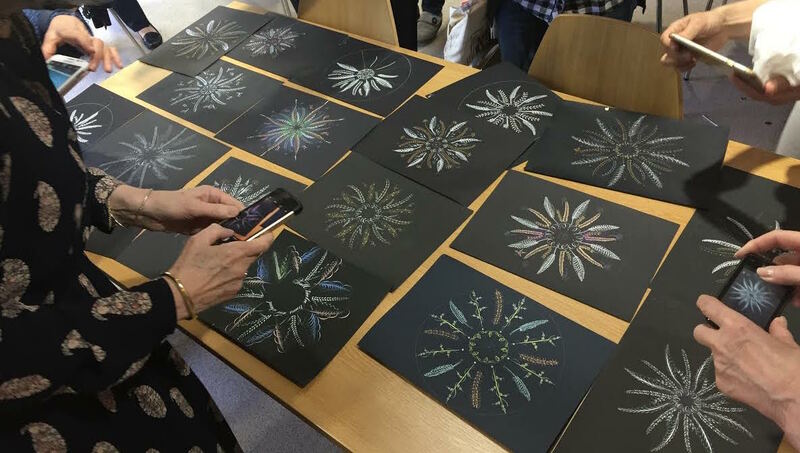 On a beautiful sunny weekend, surrounded by the delightful gardens of Fulham Palace, SLLA members gathered for a workshop with Harvest Crittenden from Michigan USA. Harvest, an internationally renowned Master Penman, is feted for her study of the Spencerian style of writing and decoration and this was the focus of the weekend course. Students had received a detailed booklet prior to the course but it was only when Harvest began to explain and demonstrate that the whole thing fell into place. All the designs are curves based on an oval shape, with the elegant lines and graceful loops being drawn with a pointed pen, which can be used to create beautiful designs and letters, as shown in the photos. Students enjoyed an unforgettable weekend, being instructed by a very special artist. Catherine Bootland’s full report of this workshop will be included in our next edition of The Inc., a quarterly newsletter for SLLA members. If you’d like to find out more and join the SLLA, please visit our Become a Member web page.